Need more information about booking Home 1291082 ? Sifnos is among the most beautiful Greek islands, perfectly suited for vacation and relaxation. Taking into consideration the needs of couples and families our group of rooms and apartments offers the perfect choice for relaxing vacation at accessible price. 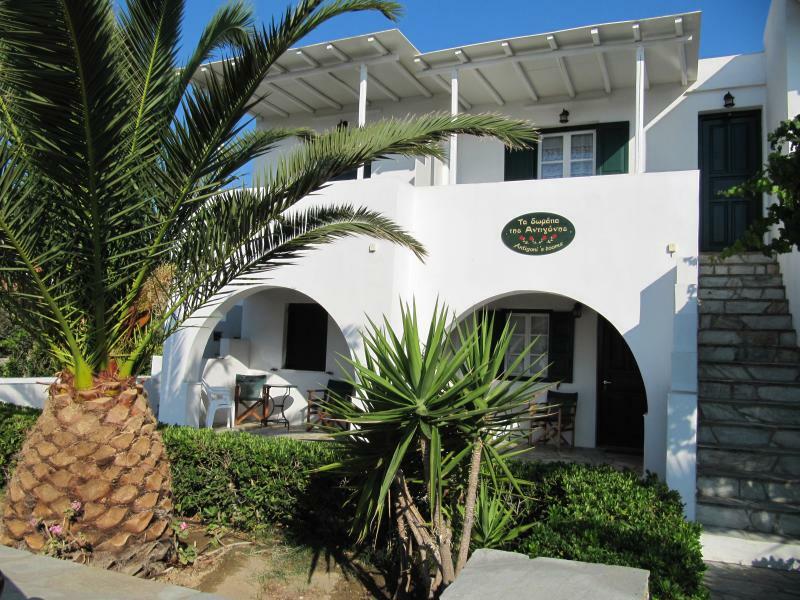 It consists of two separate units (divided by the main road) and It is located only 30 meters away from the sea in the picturesque beach of Platis Gialos. It contains 2 studios, 2 rooms and 3 apartments each one with its own balconies or stone-made yards. All of our rooms are fully equipped, offering our visitors more than basic comfort during their vacation (kitchen, bathroom, tv, a/c, wifi). Visit us to enjoy your vacation at the very heart of Aegean sea. ** Price may be different for double-room, studio and apartment. You can get in touch with Antigoni (the owner) through the contact form on this page. Send Antigoni (the owner) an email through the contact form on this page. Alternatively, if there’s a phone number on this page, you can call them. How do I contact Antigoni (the owner)? If you’ve already booked, go to Manage your holiday booking to view Antigoni the owner's contact details or send them a message. Or send Antigoni (the owner) an enquiry through the Contact the owner/manager form if you’d like a quote or more info first. When you pay online through the Book your stay form, a booking request is sent to Antigoni (the owner). You’ll find out within 24 hours whether they’ve accepted - no money will leave your account before then. You can also request a quote from Antigoni (the owner) through the contact form. The owner will email you the total cost for your dates and a link to book and pay online. Use the Book your stay form to pay provisionally online. You can pay by credit/debit card or PayPal. Antigoni (the owner) will have 24 hours to accept the booking and no money will leave your account before then. Why can't I call Antigoni (the owner) before booking? You’ll need to contact Antigoni (the owner) to do this. Send them a message in Manage your holiday booking or through the contact form on this page. You can request to change the dates or number of people on your booking via the Manage your holiday booking page. To change your holiday dates use the Edit booking button. If you need to change the number of guests staying then send Antigoni (the owner) a message. If Antigoni (the owner) agrees, they’ll send you a revised quote outlining the changes. You can review and accept/decline this from the Manage your holiday booking page. You’ll have 48 hours to take action before the revised quote expires.